If you spend a significant portion of your day fumbling for the right kind of input device for whatever project you’re working on at the moment, this dandy invention might actually make you wish you had to give more presentations at work. 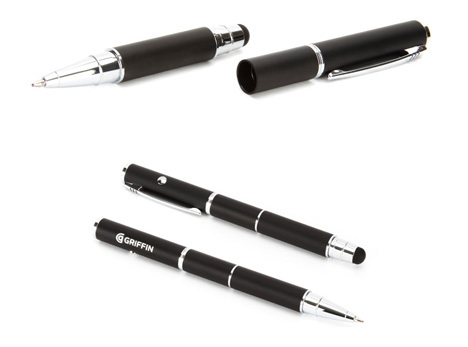 A company called Griffin (which is obviously better at inventing awesome things than naming them) presents the Stylus + Pen + Laser Pointer, a single stick-shaped thing that will point to all of your stuff. There isn’t much to say about the device that can’t be learned from its very descriptive name. It includes a stylus for your iPad/iPhone/iTouch, a laser pointer for annoying people at the movies or pointing to important pictures in your work presentations…and an ink pen, whatever that’s for. We dig the simple, refined aesthetic that means you don’t have to go hunting down interchangeable tips: the functions are all kept right there in the main body. And for those of you who like to keep all of your geek tools close at hand, there’s a handy pen clip at the top that will let you clip this baby right into your pocket protector. See more in Various Gizmos or under Gadgets. October, 2011.